It goes without saying, there’s a huge number of you who are a little more than disappointed with the iPhone’s battery life. All it takes is a few calls, a quick mess around on Pacman or Super Mario, and before you know it your battery’s gone into the red and your frustration levels hit max. 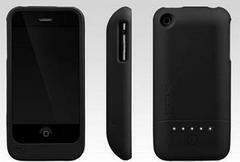 The Power Slider by Incase swears that it’ll boost your iPhone’s battery life for up to five hours talk time if it’s 3G, and ten hours if it’s the 2G model, by slipping it into its dark outer shell. It doesn’t just promise to boost talk time – audio playback time is increased to 26 hours and video playback, 7 hours. Sounds good, yes? The perks don’t stop yet. The Power Slider also lets you synch your phone while still in the encased, avoiding the wear and tear of your precious iPhone. Whether you want to compromise your iPhone’s svelte figure for a more chunkier one is up to you, but if extended battery life has mass appeal, it’s worth a look. It’s available as of 28th November here.